Allow users to become member by registering with username/password or by an external social provider. Currently Google and Facebook authentication is implemented. Display the real-time data of the vehicle monitor received from the Vehicle Monitor service. The single page application written in React. Authentication and authorization implemented with OAuth and ASP.NET identity. WebSockets to push the real-time data from the vehicle monitor to the user. This is implemented with the usage of SignalR. Some of the technologies and frameworks used in this application are pre-release and most likely to change. Currently it is based on RC1 of .NET Core. I try to update the code as soon as possible whenever the final version is released. Ping me on Twitter if you have questions or issues. 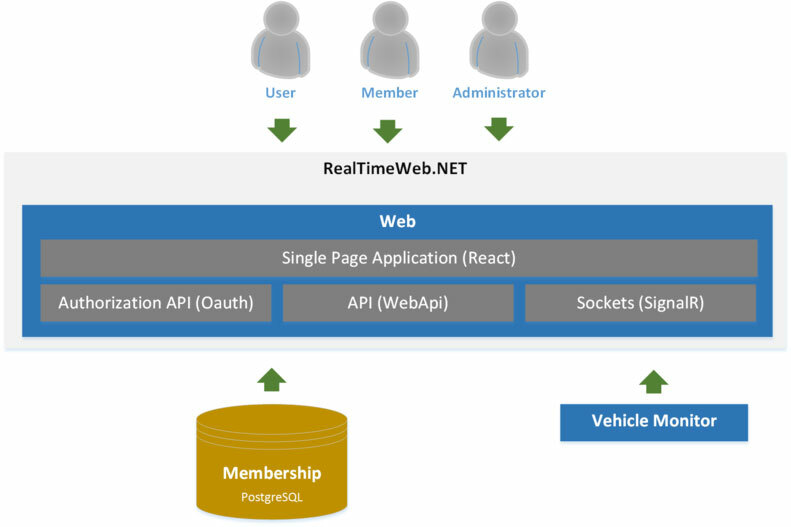 This post is part of a blog post series about RealTimeWeb.NET application.